So, it looks like I’ve bit yet another bullet (I’ve been biting a lot of those lately) and decided to attend Faerie Escape Atlanta as an exhibitor! That means I’ll have a convention every two weeks for at least 3 months starting in August. Possibly more if I find I like the taste of bullets and sign up for more cons in the area to rear my head at. But I am sitting here stumped on what I’m going to make for the great Faerie Escape! I have my prints and art tile necklaces to sell, of course, but what else? 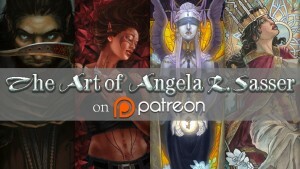 I’d really like to do something fun and faerie/angel/mythic themed, so I’m opening up the doors of inspiration! Let us CREATE! But I’d like to think of things in a more mythic fantasy theme. Maybe faerie king/queen masks? Celtic knot masks? Leafy masks? More jewelry with leaf and feathers? Butterfly and angel wing necklaces and keychains? Halp! My mind is all over the place. Would love to hear what you guys would like to see in a mystical fairy/angel theme from me 🙂 So fire away! Disclaimer: By suggesting an idea, you are of course giving me permission to play with that idea however I see fit. I’ll credit where I can, but I can’t promise royalties. This is just casual fun brainstorming session, not an attempt to make a corporate enterprise.